Apart from incidents of road rage, traffic jams have turned this hill station into a chaotic madhouse stranding tourists on traffic spots in Manali, at the Beas Nullah and Rani Nullah, 4 km before the Rohtang Pass on the Manali- Leh highway for eight to 10 hours daily that has made holiday in Manali a nightmare. After the state government’s directive to ensure construction of rainwater harvesting tanks in newly constructed government and private buildings, the Town and Country Planning (TACP) Department has issued notices to about 1,500 building owners to construct rainwater harvesting tanks or face stringent action. After a lull of several months, the police arrested five employees of the Himachal Pradesh Board of School Education (HPBSE) here today. The arrested officials include Chet Ram, Superintendent, Manohar Lal, Gian Chand and Madan Lal, senior assistants, and Omkar, junior assistant. The Baddi University of Emerging Sciences and Technology is going extra miles to secure placements for its students, with 54 corporate houses selecting its students from engineering, pharmacy, MCA and management streams for the 2010-2011 academic session. Union minister Virbhadra Singh, addressing a workers’ meeting at Kanaid near here today, said the Congress had lost the previous Assembly elections due to wrong distribution of tickets. He was addressing party workers of the Nachan Assembly segment. He further said such leaders were still trying to get tickets in the Assembly elections. He said only winning candidates should be given tickets and it would be in the interest of the party. Making an all-out bid to wrest power from the BJP, the Opposition Congress will kickstart its campaign for the Assembly poll with the “Takhta Palat” rally being organised at Baddi on June 29. The state will get 43 new LPG agencies under the Rajiv Gandhi Rural Gas Agencies Scheme. Out of these, 10 new LPG agencies will be opened in Kangra district. Even as the government is giving final touches to ensure the shifting of the District Court complex to the new site at Chakkar, lawyers are once again gearing up to oppose the move. The High Court today directed the Union Ministry of Environment and Forest and the Animal Husbandry Board of India that in case the request of the state government for release of the fund assistance was pending with them for primate protection parks, relocation, sterilisation, etc for protecting crops from wild animals, then consider it in accordance with law and take appropriate action within one month. In order to give the much-needed fillip to the thriving tourism industry and allied activities in Dalhousie, the local administration has started organising cultural bonanza, being performed by folk artistes of Chamba district from June 18 which will continue till July 3. A case of child marriage has come to light in the Indora police station when the victim, a resident of Shekhupura village, lodged a complaint yesterday. 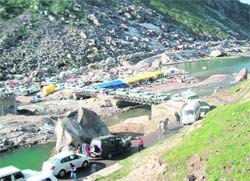 Apart from incidents of road rage, traffic jams have turned this hill station into a chaotic madhouse stranding tourists on traffic spots in Manali, at the Beas Nullah and Rani Nullah, 4 km before the Rohtang Pass on the Manali-Leh highway for eight to 10 hours daily that has made holiday in Manali a nightmare. Tourists not only take back bitter memories of traffic jams on the potholed roads between Marhi and Rohtang and between Koksar and Rohtang, but also become witness to rowdy brawls daily in this town. A hot topic of holiday experience among tourists is not what they see at Rohtang Pass or Manali, but where and how many times and how long they got stuck in traffic jams. The Rani Nullah, 4 km short of the Rohtang Pass, a snow point for tourists and the highway stretch between Kothi and Manali bridge, the Circuit House-Hidimba road and Rongri-Manali Mall road are clogged with traffic. Everyday more than 6,000 vehicles jammed Manali for five to six hours as there is no room for parking in this town. There is no proper parking for 1,000 local taxis and vehicles, leave alone accommodating a fresh lot over 1,500 tourist vehicles that move into Manali every day from outside. As a result, tourists park their vehicles on roadsides that block the movement of traffic creating traffic jams. Incidents of road rage have become the order of the day. Four young tourists from Ukhlana, Haryana, in an Indica car were beaten up with iron rods by local youths in front of the Circuit House when they got into a brawl on Saturday. A Supreme Court judge, Justice Aftab Alam, who was staying in the Circuit House from June 17-19 expressed concern over the noise of the crowd. The security staff of the judge rushed to the spot, but the police had not reached, said residents living nearby. The injured tourists, Satyabhan, Narender, Sajan Singh, were rushed to Mission Hospital as they were hit grieviously. Later, they were referred to the PGI or the Fortis. The police lodged an FIR under Sections 323, 147, 148, 149 IPC, but it has yet to arrest the accused. “The things have become uncertain whether you will reach Keylong or back Manali”, observed Jagmit and Upsak, tourists who got stranded at the Rani Nullah and between Kothi and Manali for four hours yesterday, while on their way to Leh. The tourists rued that they paid green tax, but they did not get parking space in the town. The police also blamed the traffic jams on the local administration which had failed to create public parking lots despite it collected more then Rs 3.50 lakh daily as green tax from tourists. SP, Kullu, Abhishek Dular said they had deployed over 40 policemen between Manali and Rohtang. “We are increasing evening patrol on the road and trying to identify the accused and check incidents of road rage”, he added. The TACP Department has asked the building owners, who had undertaken new construction after 2005 and obtained NOC from the department and have still not constructed the tanks to store rainwater, to construct the same or face power and water disconnection. According to sources, such notices have been issued in many towns and even in Hamirpur about 150 building owners had been issued notices. The TACP Department had given NOC to building owners on the condition that they would construct water tanks for the rainwater harvesting in the new buildings. The state government, which had covered all new buildings being constructed in urban areas under the purview of this provision, has now extended this to even private and government buildings being constructed in rural areas too. While the TACP Department has been authorised to enforce this norm in urban areas, rules are being framed for implementing the provision in rural areas. in the area above 1000 square metres. State planner AN Gautam said, “Since the state government is serious in enforcing the proviso of rainwater harvesting tanks in every building, we have issued notices to those people who had obtained NOC from us, but still have not constructed the water tanks in the urban areas”. Earlier also, the police had arrested four board employees in the case. SP, Kangra, Diljeet Thakur said after investigation, the arrested employees had been found to be directly involved in the scam. They had also been arrested under Sections 420, 465, 468 and 471, IPC. The examination scam had rocked the state last year when it was found that hundreds of students had passed without appearing in the exams. Kingpin of the scam Ashwani Dogra used to run a private academy in the Gaggal area of Kangra district. He used to take money from students on an assurance that they would pass board classes without appearing in examinations. The students used to fill forms as private students. Thereafter, Dogra used to receive the roll numbers of the students at his centre in connivance with postal employees. The student never appeared in examinations. Instead Dogra used to solve their papers at his centre on the board answersheets that he allegedly managed in connivance with certain employees. The answersheets were directly sent to the evaluation centres established by the board. The papers were marked and students were declared pass. The board employees had been maintaining that the scam occurred due to lapses in the system. Earlier, when the police arrested education board employees, their union organised a dharna in front of the local police station to express solidarity with their colleagues. The police has made over 200 students, who were beneficiaries of the scam, as party in the case. The fresh arrest of the education board employees by the police has added new dimension to the case. Several national and multinational companies like Infosys, TVS Motors, Wipro Infotech, HDFC Bank, WeP Peripherals, HT Media Ltd, Larsen and Toubro , Outline Systems India Private Limited, Kirloskar, Ambuja Cements, Thomson Digital, ACME Formulations, Edelweiss, Baseware, Cosmos Researh Labs, Ark Microsystems, Beta Soft Technical, Reliance Communications, Cadbury India, selected the students in a series of campus placement drives organised by the university management. “The number of companies visiting the campus has gone up this year and this has helped fulfil the aspirations of the students. B Tech students managed to bag a salary package of Rs 4.25 lakh per annum while MBA students were placed at a salary package of Rs 4.8 lakh,” said Vinay Chopra, manager, Training and Placement. He added that a variety of industries had recruited students unlike previous years where placements saw fewer firms. IT firms, pharmaceutical, online media firms, construction giants and automobile sector were among the new entrants this year, who participated in the placement drive. Dr AK Sahijpal, Vice-Chancellor of the university, stated that corporate placement was the ultimate ambition of the university. BILASPUR: A total of 585 youth were given employment and appointment by 15 reputed companies, industrial houses and concerns in the day-long Rozgaar Mela organised by the state Department of Labour and Employment at Naina Deviji, 95 km from here, today. This mela was earlier inaugurated by local MLA Randhir Sharma who said such melas were being organised by the government under its exhaustive and planned programme of providing employment to a large number of youths of the state, mostly in the state itself and even outside it. He said 1,315 youths had got themselves registered in this mela for employment, while 585 were given employment according to their qualification and training then and there. State department Deputy Director Manoj Tomer and state Vocational Training Officer Bishan Kumar were also present. Union minister Virbhadra Singh, addressing a workers’ meeting at Kanaid near here today, said the Congress had lost the previous Assembly elections due to wrong distribution of tickets. He was addressing party workers of the Nachan Assembly segment. He further said such leaders were still trying to get tickets in the Assembly elections. He said only winning candidates should be given tickets and it would be in the interest of the party. He said he was not in the race of chief ministership, but would follow the order of the high command, and whatsoever duty was assigned to him, he would fulfil it. He further appealed to Congressmen that it was not the time to fight within the party, but with the BJP. He said he would visit all Assembly segments of the Mandi parliamentary constituency. He accused the BJP of closing 778 primary schools recently and planning to close 2,500 more schools. Former minister Rangila Rao, Ramlal, Anil Sharma (MLA Mandi), Parkash Chaudhary (MLA Balh), Tek Chand Dogra, former MLA Nachan, Sohanlal, former MLA Sundernagar and spokesman of the Congress, and Puran Chand, district Congresss president, along with other, also spoke on the occasion. It will be first of the series of big rallies the party plans to organise in the run-up to the election which is more than a year away. The rallies are being organised on the directions of the high command to project a united image of the faction-ridden party by bringing the warring state leaders on a common platform to launch an offensive on Dhumal government. Besides, national general secretary Birender Singh, who is also the in-charge of the party affairs in the state, some other Central leaders will also address the rally. The theme of the campaign will be “Himachal on Sale” and the party has selected Solan district, which has seen the maximum land transactions, including the land allotment made to Swami Ramdev. The slogan for the rally is “Bhajapa Hatao, Himachal Bachao, Congress Lao”. “The Dhumal government had reduced Himachalis to second-grade citizens in their own state by opening floodgates to outsiders in the garb of opening private universities,” points out PCC chief Kaul Singh. While local people were not being allowed to enter the forest areas and their traditional rights were being curtailed, private companies have been allowed to open resorts with five-star facilities. The next rally will be held in Shimla during the Monsoon Session during which the party will gherao the Vidhan Sabha. The problems of apple growers, bad conditions of the roads, corruption and issues pertaining to the Shimla Municipal Cooperation will be the dominant issues. Minister for Food and Civil Supplies Ramesh Dhawala gave this information while talking to newsmen here today. He said new gas agencies would redress the problem of shortage of LPG in the state. In Kangra district, gas agencies would be opened in Suliali, Baroohi, Gangath, Indora, Chalwara Khas, Nagrota Surian, Paror Khas, Kalor, Aberi and Paprola. Of these, two gas agencies would be allotted on lottery basis. The minister also alleged that the Union government was biased against the state. The kerosene and rice quota in the state had been reduced by half. Till March 2010, the state was getting 4848 kilolitre kerosene per month. It has been reduced to 2,580 kilolitre per month by the Union government. Similarly, rice quota for the state has been reduced from 18,000 metric tonne to 7,118 metric tonne, Dhawala said. The minister also said 184 quintal foodgrains had been sent to the remote Bara Bhangal area. In Mand Mayana area also, foodgrain supplies had been sent before the monsoon. He further said the Food and Civil Supplies Department had been directed to conduct raids across the state to check the misuse of domestic LPG cylinders. Even as the state government has been directed by the High Court to file its reply on the issue at the hearing scheduled for June 29, the Public Works Department has informed the Home Department that it will complete the structure before August 31. Rs 25 crore has already been spent on the District Court complex. The lawyers have been opposing the proposal to shift the District Courts from the present location in the heart of the town to Chakkar, on the outskirts of the town from day one. Now with the deadline for shifting the court complex to the new location, they seem to be in no mood to relent and could once again resume their agitation. “We are waiting for the court observation due on June 29 after which we will chalk out the next course of action,” said SS Deshta, president of the District Bar Association. He said the lawyers were in no mood to shift as all facilities had not yet been created at the new site. “As against the requirement of 121 bighas of land, the forest clearance for only 19 bighas has been obtained, thereby enabling the construction of only the judicial complex,” rues Deshta. A Division Bench comprising Chief Justice Kurian Joseph and Justice Sanjay Karol passed this order after the submissions made by the state before the court that it had already requested the Central Government and the Animal Welfare Board to release Rs 14 crore and Rs 1 crore for primate protection parks, relocation, sterilisation, protection parks etc for protecting the crops from monkeys. Acting on a petition filed by NGO People For Animals against the decision of the state government vide which it had allowed the farmers to kill the wild animals, the High Court in its earlier order restrained the Forest Department from issuing permits to farmers for killing the wild animals, especially monkeys and had suggested some preventive measures like use of barbed fencing, fire belt, use of crackers, trained dogs, obtaining funds for primate protection parks, relocation, sterilisation, protection parks etc for protecting the crops from wild animals. After this order the state had taken up the matter with the Central Government and the Animal Welfare Board of India for financial assistance in this regard. Dalhousie SDM Madhu Choudhary told The Tribune over the phone today that since the Chamba region was culturally rich and renowned for its folk culture, folk artistes from different terrains of the district were being invited to perform their traditional music and dance items at focal points, including the Gandhi Chowk and the Subhas Chowk of the scenic hill town on every Saturday and Sunday alternatively. “Chamba’s rich culture not only ensures attracting huge influxes of tourists and visitors to this picturesque hill station, but also gives them an opportunity to enjoy the unique folklore through their songs, dance and musical concert of artistes belonging to Chamba,” the SDM said. The initiative will go a long way in luring tourists from the neighbouring states, other parts of the country and abroad, Choudhary added. Established in 1854 by the British Empire, the hill station has been named after Lord Dalhousie, the then Governor-General of India. She alleged that her mother Anita, Ranjit and his mother Krishna Devi, residents of Bari village, conspired her marriage with Ranjit at the age of 16. The victim in her complaint said Ranjit was a tenant and had been living in her mother’s house since 2008. Ranjit’s mother proposed their marriage. The victim’s mother at first turned down the proposal, but after a few days, their mariage took place on September 9, 2008. She alleged that her husband forcibly had physical relations with her and used to thrash her. Then after staying at her in-laws’ place for sometime, she returned to her parents’ house. Kangra SP Daljeet Thakur said a case had been registered.